A year ago I didn’t even know this place existed. Ever since I found out about it and first saw pictures out it I’ve put this place at the top of my dream destinations. I think it is easy to think that the grass is always greener, than the flat a little further out of the way has a bit more life on it and I’ve been fortunate to get to Cuba and Belize and Andros and those places are not shy of amazing bits of bonefishy biomass, but this place, this St. Brandon’s Atoll, I think this may be the pinnacle. When I heard Jim was headed there to do some filming for his next film project as part of Confluence Films, I knew I needed to hear more from him about his trip. He agreed to answer some questions about his trip and here they are (you can also see his full photo album here). St. Brandon’s Atoll seems to be very, very far away. What was the travel like to get there? It was a long trip, to say the least. Bozeman to Minneapolis, and then the 11 hour flight to Paris. A 10 hour layover in Paris, and then a 12 hour flight to the island of Mauritius. We overnighted there, and then departed the following afternoon on the boat for St. Brandon’s. It’s a large, sturdy boat (about 100 ft.) but it still feel damned small in the big waters of the Indian Ocean. The “crossing” from Mauritius to St. Brandon’s takes anywhere from 25-30 hours, depending on the size of the seas. Bottom line is that it takes some serious time to actually arrive on the flats of St. Brandon’s; in our case about four solid days of travel. That said, it is more than worth it. I would hop on a plane and do it all again tomorrow if I could! Once you got there, all that way there, was there anything you thought “Man, I should have brought X.”? Heavy duty wading boots and neoprene guards to go over the top of your boots and heavy socks. You definitely do NOT want the thin-soled wading boots or booties over there. There are thing like stone fish and poisonous cone shells that will flat out kill you if you step on them, so your footwear needs to be heavy duty. Heavy duty hooks (the Owner or Gamakatsu’s) for the GT flies are key. If you have cheap hooks or hooks that are too thin, you’re out of luck. Tropical floating fly lines are the go-to set-up, and you will definitely want to bring a few back-up lines as well. Several lines are lost each and every week out there to huge, unstoppable fish! A good waterproof boat bag is key, as you and your gear do get wet in the small “tenders” that they use to run between flats. If you have camera gear, bring a Pelican case for the boat as well. Plenty to read, and a few DVD’s as well. You spend four days of travel on each end of the trip, so bring plenty of books. There is a TV and DVD player on the boat as well, so bring some movies for the crossing. A lot of the people on the trip brought some heavy duty sleeping pills for the flights and for the crossing. I have personally never been able to take anything, but this is something that may come in handy on long trips like this. Basic flats clothing. Cover yourself from head to toe with pants, long sleeved shirts, Buffs, hats and gloves. The sun down there is fierce, and you are on the flats ALL day long. They do have daily laundry on the boat, however, so you can still pack light. Bring your liquor of choice. Beer and sodas are included, but you will want to pick up any liquor at the Mauritius or Paris Duty Free stores. I’d imagine there isn’t much fishing pressure out there. Do you have any idea how much pressure there actually is out there? Zero pressure. The guys at Flycastaway have the exclusive concession on the entire atoll. Locals Mauritians with their own boats are allowed to go there, but the crossing is a big deal in anything but a large boat, and once there, you really have to know where to fish, when to fish, what the tides are doing etc. These guys have spent years figuring out the fishery out there, which is the reason that they are so dialed in. They host a handful of groups in the spring, and again in the fall. Sometime only 6-8 groups a year. The atoll itself is HUGE; there are still vast areas of the Atoll where these guys have never fished or even explored. 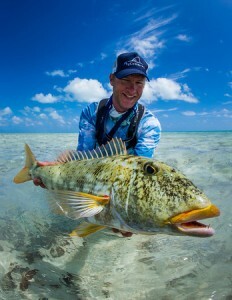 At a maximum of eight anglers per week, in an eco-system of this size, you can do the math on the total amount of angling pressure that the atoll sees. From what I can tell, those Indo-Pacific Permit, are actually a species of Pomapano that look pretty much identical to Permit. How Permity were those Permit? I am not a fisheries biologist, but I have been around permit a fair bit. To me, these looked like permit, acted like permit, and refused flies like permit! The colorations of the fish are different (they are bit more “yellow-ey”) but other than that, they look exactly the same. 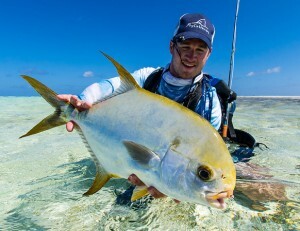 St. Brandon’s had a ton of permit, and – according to the guys at Flycastaway – this is the largest concentration that they have found anywhere in the entire Indian Ocean. As far as behavior goes, they act, eat, fail to eat, and piss you off exactly the same as their Caribbean cousins. We did – as a group – manage to catch several over the course of the week. They are an awesome looking fish, for sure. What’s the variety of fishing like there? The diversity is amazing. 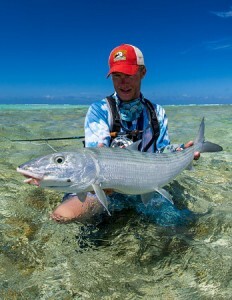 The bonefish are truly huge, and they are EVERYWHERE! On top of that, you have Giant Trevally (GT’s), blue-fin trevally, spotted trevally, permit, triggerfish, several different types of sharks, gar-fish, several types of Emperor fish, and a few other types of trevally. That is perhaps the coolest thing about St. Brandon’s – the variety and diversity of species. What was the most surprising thing about fishing in St. Brandon’s? To me, it really felt like we were the first ones to ever fish there. It is a prime example of what a flats fishery could be if it were totally untouched by the hand of man. It is remote as can be, and it takes some serious effort to get there, but it is 100% worth it. The other thing that really blew me away was the quality of the Bonefishing. Six and seven pound fish are routine there. Legitimate, double-digit fish are caught on a daily basis. The bones also eat with reckless abandon, as if they have never seen a fly before (which they haven’t). I can’t tell you how many bones were caught at our feet; scenarios where the leader was literally inside the rod guides and the fish ate the fly within three feet of the tip-top. Truly amazing. You’ve got yourself to some pretty remote places. How does this place compare? It’s up there, for sure! You definitely felt like you were in the middle of nowhere. Its also one of the few fishing destinations these days that allows you to totally and legitimately disconnect from everything. No cell phones, no Wi-Fi or satellite internet, no boat traffic …. You have the entire place all to yourself. That trip isn’t a cheap one and the time commitment is substantial. There are plenty of places that offer fantastic fishing, so what is the thing that makes this destination worth the added investment? Hands-down this is the finest Bonefishing on the planet. The numbers and size are both mind-blowing. On top of that, you have the opportunity for GT’s, permit, other types of trevally – all on a daily basis and at any given time! The ecosystem itself is pristine and untouched, which is something to see. Sadly enough, that is getting harder and harder to find these days. I’m looking forward to going back over there next year, and we’re excited to be adding this to the Yellow Dog line-up for future bookings. I typically hate the phrase, “Trip of a lifetime,” as I believe it is over-used on every level. That said, this is a trip that legitimately falls into that category. This entry was posted on Tuesday, December 4th, 2012 at 1:14 am	and is filed under Locations. You can follow any comments to this entry through the RSS 2.0 feed. You can leave a comment, or trackback from your own site.